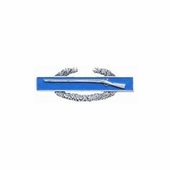 Our Miniature Dress Combat Infantry Badge is a silver and enamel badge 1 1/4 inches in width, consisting of an infantry musket on a light blue bar with a silver border, on and over an elliptical oak wreath. This is the same badge that is supplied to the U.S. Army and sold in the Army Post Exchanges. The Combat Infantryman Badge is a U.S. Army Badge, it has a blue bar, the color that is associated with the Infantry. The musket is adapted from the Infantry Insignia of Army Branch of Service and represents the first official U.S. Army shoulder arm, the 1795 model Springfield Arsenal musket. It was adopted as the official Infantry branch insignia in 1924. The oak symbolizes steadfastness, strength and loyalty. AWARD ELIGIBILITY: There are basically three requirements for award of the CIB. The soldier must be an infantryman satisfactorily performing infantry duties, must be assigned to an infantry unit during such time as the unit is engaged in active ground combat, and must actively participate in such ground combat.